Wash and dry strawberries. Cut off tops to leave a flat surface. Stand whole strawberries in bottom of spring form pan. Chop and melt White Chocolate in microwave in glass pan, stirring at 30 second intervals until little pieces remain. Stir until completely melted. Set aside. 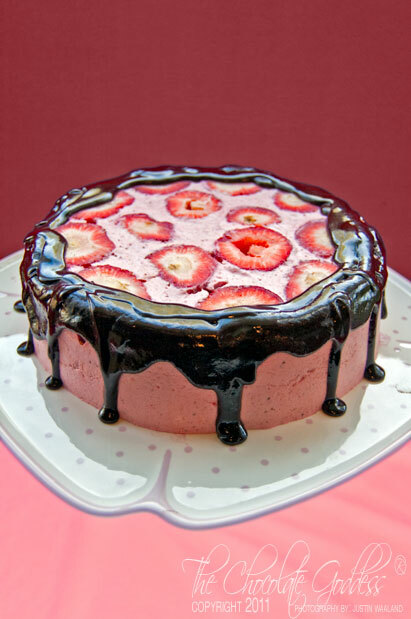 Beat cream cheese, lemon juice, confectioner’s sugar, pinch of salt and pureed strawberries. Dissolve gelatin by sprinkling it in a small pot with a half cup of cold water. Heat and stir until just dissolved. Add to mixture. Fold in whip cream thoroughly. Pour into pan and refrigerate for a few hours. Heat the outside of spring form pan slightly with hair dryer before opening ring. Run hot knife around edges. Open sides and remove ring. Turn upside down onto serving platter. Heat bottom disc with hair dryer, run knife around edges and lift off bottom metal disc. Heat heavy cream to simmering point and pour over crumbled chocolate. Mix on low speed, cool a bit and add corn syrup. Spoon over edges of mousse.